Seher Indian Cuisine uses their own specialised couriers to deliver their food. The best of vegetarian entrees from us. The best of non-vegetarian entrees from us. Chicken marinated in various herbs and spices which is cooked in tandoor. Boneless chicken marinated in various herbs and spices which is cooked in tandoor. Lamb mince marinated in various herbs and spices which is cooked in tandoor. Marinated in various herbs and spices. Boneless chicken marinated in various herbs and spices cooked in authentic traditional sauce with onions and capsicum. Boneless chicken marinated in various herbs and spices cooked in authentic traditional sauce. Boneless tandoori chicken pieces cooked with onions and capsicum in traditional style. Goat cooked with onions and capsicum in traditional style. Lamb cooked with onions and capsicum in traditional style. Marinated prawns cooked with traditional style. Lentils cooked with traditional style. Lentils cooked in traditional style with butter. Mixed vegetables cooked with authentic traditional style. Cauliflower cooked in traditional style. Eggplant cooked in traditional style. Cottage cheese cooked in kadai sauce with onion and capsicum. Cottage cheese cooked in butter and nuts' sauce. Cottage cheese balls cooked in authentic traditional sauce. Okra cooked in traditional style. 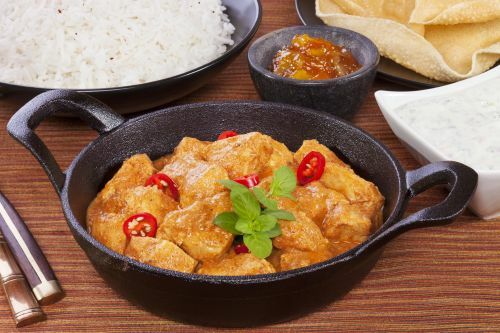 Boneless pieces of chicken cooked in fresh fenugreek and special sauce. Boneless chicken cooked with dices onions and capsicum in a thick authentic sauce. Chicken cooked in authentic vindaloo sauce. Boneless chicken cooked with mango puree. Boneless chicken cooked in traditional coconut milk. Boneless chicken cooked in South Indian style. Boneless chicken cooked in tandoor along with onions, capsicum, herbs and sauce. Boneless chicken cooked in tandoor mixed with butter sauce. Boneless lamb cooked in authentic style. Boneless lamb cooked in authentic vindaloo sauce. Boneless lamb cooked with a hint of pepper. Boneless lamb cooked in South Indian style. Boneless lamb cooked in authentic traditional style. Boneless goat cooked in authentic vindaloo sauce. Goat cooked in traditional way. Goat cooked in mild authentic sauce. The best of seafood from us. Fish cooked with traditional herbs and spices. Fish cooked in traditional sauce with fenugreek. Prawn cooked with traditional herbs and spices. Prawn cooked in South Indian style. Enjoy the true taste of Indian cuisine. Stir fried vegetables cooked with rice. Stuffed lamb mince served with mint sauce.